Feelings can be uncomfortable, both our own and other people’s. We often find them difficult to cope with because we haven’t been taught how to properly express and deal with them. Keeping feelings locked away is not healthy, it is much better to be able to express them in healthy ways, without hurting others. It’s very important to be able to understand the way we feel, as our feelings effect our inner sense of wellbeing and our outward behaviour, and our behaviour effects the way others interact with us which in turn effects the way we feel. If we can understand how we are feeling and why, then we can choose our reaction to it and change the way we deal with it to make a more positive and healthy experience. You can think of our emotions as being on a giant sliding scale, on one end is the most negative emotion and on the other the most positive, then there is everything in between. Every emotion has a purpose and a place in our life and serves a function, whether we know it or not. 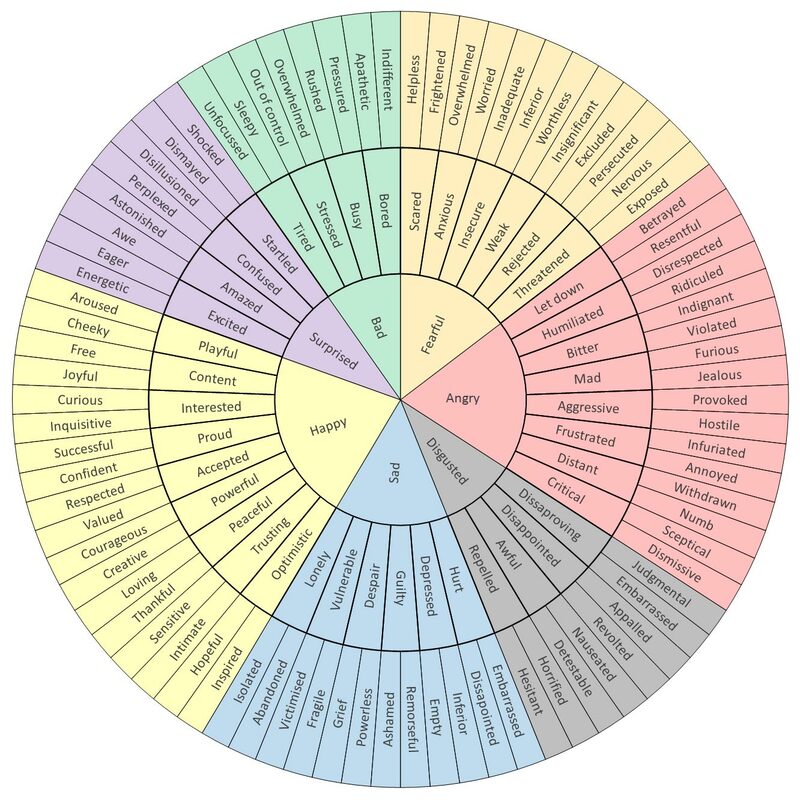 This ‘wheel of emotions’ can help us to identify how we are feeling when we may not have the word for it. Fold a piece of A4 paper into 4. In the top left hand corner make a list of all the positive emotions that you can think of. In the bottom left hand corner make a list of all the negative emotions that you can think of. Now in the top right hand corner list all the things that make you feel these positive emotions. In the bottom right hand corner list all the things that make you feel these negative emotions. All these emotions are a natural part of human nature and we all feel them. Positive emotions are a lot easier to express and to understand, we rarely need to explore them and can be content to enjoy them. But negative emotions are more complicated. We often don’t understand or acknowledge negative emotions. They feel painful and uncomfortable so we either try to ignore them or we react to them through our behaviour. But if we continue to bury these feelings they only get worse. Our behaviour can spiral out of control as we try to find ways of dealing with the hurt and we can end up being misunderstood, isolated and caught in a vicious cycle of negativity. To really face an emotion is to try to find the root cause of it. Understanding what that emotion is and where it is coming from is a vital part of learning how to best deal with it. A useful notion in understanding how we feel is that of primary and secondary emotions. Primary emotions are those that we feel as a first response to a situation. For example, if we are threatened, we may feel fear. If we win a competition, we might feel happy. These emotions are fast acting, instinctive responses that we have and they can happen before we’re even conscious of them. Typical primary emotions include fear, anger, sadness and happiness. These emotions are some of the oldest survival mechanisms we have and can be seen throughout the animal kingdom. Primary emotions tend to disappear as fast as they appear. They are replaced by secondary emotions which can complicate the situation, making it difficult to understand what is really going on. Secondary emotions may be caused directly by primary emotions, for example fear might easily turn into anger, preparing your body and mind for a fight. Secondary emotions might also arise from chains of thought, for example sadness might trigger a process of thinking that leads to feelings of profound worthlessness. Secondary emotions may be straightforward feelings or the could just as likely be a mix of emotions that are hard to untangle from one another. Have you ever heard of a love/hate relationship? That’s when many different emotions are at play, often seemingly in conflict with each other but all adding to the whole. What we can do to understand what we are feeling is really slow down and question ourselves. We need to work out why we feel what we feel so that we can get to the source of what is causing us distress. In this way we can treat the cause and not just the symptoms. You may well be surprised by what you find out!